Guess who's back, back again, Tuesday's back... tell a friend! That's right, it's time for this weeks #TuesdayTakover! Say hello to Millie from A Beauty Romance, who's not only a fellow beauty blogger but also a fellow Journalism student who has just completed her first year of university *insert clapping emoji here*. When Emily contacted me asking to write a guest post I knew I had to share some of my favourite products for those of you who don't know me already. First off though, I would like to thank Emily for letting me feature on her lovely blog today, the blogging community is so nice and welcoming, I love it! Into the post itself, and I thought I would share with you the base products I've been loving and wearing all month. Priming is a key step for me and one I never tend to forget. I've been trying out The Body Shop Vitamin C Glow Enhancer and love that it brings some life back into my lack lustre skin. Their Vitamin C range is fab for those of you who suffer with tired and dehydrated skin as they really help to brighten the completion, and I find this one great for diminishing pores too. I love to follow this up with the Bare Minerals Complexion Rescue which has been everywhere this summer and for good reason. As far as tinted moisturisers go this is definitely one of the more hydrating ones I've come across which makes it a dream to apply. Like most of my bases, I like a dewy finish which this definitely gives without being oily. I apply it with my Real Techniques Buffing Brush and within a few seconds I'm ready to go. 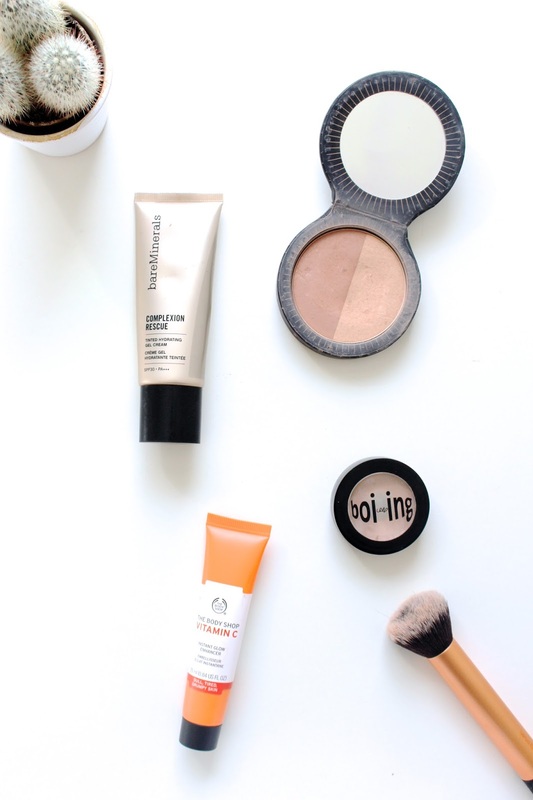 If you're on the hunt for a new base which has SPF (this has SPF 30 which is great!) then I would definitely recommend hitting this up, the shade range is also really good. For concealer, I tend to only use it under the eyes so I go for higher coverage options such as Benefit Boi-ing. I have this in a lighter shade than my skin to lift and brighten the under eye area. The formula is quite thick but it's not drying like some other heavy duty concealers so a good one to use. To finish everything off I applied some Soap and Glory Bronzing Powder on my cheek bones, forehead and down my nose. This is a lovely bronzer and has two different shades which are perfect to use individually or mixed together. Make sure you head over to Millie's blog and leave a comment!